Following the completion of the St. Louis, Oklahoma and Southern Railway in 1900, Okmulgee entered into a new era of expansion. A growing number of new residents encouraged the platting of housing additions, and new water, natural gas, telephone, and electrical systems were installed. At 1907 statehood, Okmulgee had over 2000 residents and was quickly becoming a bustling city full of life. Daily life in Okmulgee generally followed the trends set forth in the rest of the country, although at the time Okmulgee was sparsely developed. The entire Okmulgee county population numbered only 4,000, including 179 blacks. The earliest non-Indian settlement was known as the "White Settlement" and was located about one mile east of the railroad station on what is now East Fourth Street. The twenty acre area included two or three houses, a hotel, a general merchandise store, grocery store, and a school for whites. Around 1900-1905, the businesses moved to the east side of the Frisco Railroad tracks where the first, and at that time the only hotel was located. The hotel was named The Capital and was conducted by Silas Smith, a prominent member of the community. North of the hotel was located the wetmore grocery store and a large rock building, at what is now second and Comanche, which served as a hay barn to store baled hay for shipping via the railroad. On the corner of fifth and Morton was a lot which had been used by the creeks to slaughter cattle and corral horses. A large gate marked the end of Morton street, beyond which was open pasture. Entrepreneurs built the Key Block on the street. 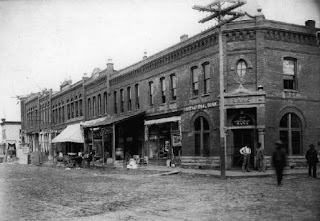 On Main Street, from the post office west, the rest of the block was lined with tents which housed establishments of less savory ilk - gambling houses, brothels, flea-bag boarding houses, and bootleg whiskey Joints. Prohibition was a farce in those days. Barrels of liquor were hauled into the Nation by wagonload. They were dispensed at 50 cents a pint, 25 cents a half pint. In the early days of the drug business, retail druggists manufactured their own products from primary ingredients. Quinine and calomel were common remedies. There was only a single telephone line in Okmulgee. It stretched from Muskogee to one of Okmulgee's drug stores. While many businesses sprang up around the Creek Council House, Agriculture still prominent business in area. From around 1908 until the next decade, many people moved to Okmulgee to scout for oil. With the coming of the railroad and discovery of oil around Okmulgee, this sleepy little town was soon to become home to more millionaires than anywhere else in the country.